IT’s Back! It’s Bigger! It’s Better! 2019, May 25 – June 1st! We have two places to stay at! You can choose from a double room at the Little Cayman Resort (20 spots), and for a limited number of divers, we have two luxury condos, each for four people (8 spots) available at the ‘Club at Little Cayman’, which is just a short stroll down the beach from our dive shop. 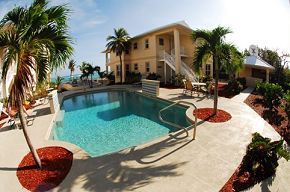 Spend a relaxing week at the premier, deluxe, full service resort(s) on Little Cayman Island. We have been there multiple years running, and we’re going back again – because it’s just that good! Rated as the number one destination in the Caribbean for wall diving, number two for favorite reef diving, the sea life and underwater photography, the dive sites, water temps and visibility are outstanding, never to be forgotten by those who have experienced them. For those of you who have not experienced the diving at Little Cayman, it’s everything you can dream about, dramatic vistas, amazing photo opportunities/views, wildlife that must be seen to be believed (like the friendly groupers that follow you like a puppy everywhere)! Divers don’t have to lug gear every day from their rooms or even onto the boat. Your gear will be collected once you arrive and stored at the shop next to the dock. You set up your gear the first day on the boat and after that, the Reef Diver crew set up your gear and change your tanks for you. You need only to stroll down the dock, jump on a boat (the large, comfortable, covered boats!) and go diving. The four boats are 42 to 46 ft long and 16 ft. wide and have freshwater showers and restrooms. Rinse tanks and a drying room are on the dock for mask, fins and wet suits. Once there, we dive, eat, relax, and just generally have a fantastic time for the whole week! There are pools at both resorts, wi-fi, beach chairs and hammocks, and you can rent kayaks, sailboats, and paddleboards as well. 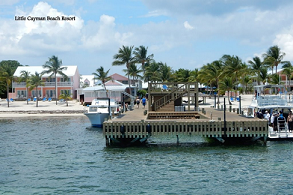 All diving and dining will be done at the Little Cayman Resort. Nitrox comes included! And you can also purchase extra afternoon dives either as a package or as individual add-ons (although without the discount in that event). If you want to sign up, click here to down load the signup sheet: 2019 LCBR signup v1.10.pdf, fill it out, then mail it with a check and with copies of your Certification Card and diver's insurance to the Club Treasurer, Ronnie Farr. Contact Nils Jacobsen at overseasdiving@usadiveclub.com for more information! Download the attached files for Cuba Signup!